It's always a pleasure when anything patent-related enters the mainstream. Recently, Stephen Colbert took on the absurd inventions that companies attempt to patent. In this case, the host of Comedy Central's The Colbert Report lampoons Amazon's new patent on a method of photography in front of a white background. The patent, like many patents issued today, uses seemingly complex language to describe a fairly simple idea. While the patent gives examples in its claims of a specific set up, down to particular F-stop settings and ISO values, the patent features typical boilerplate language: "variations and modifications may be made [...] without departing substantially from the spirit and principles of the disclosure. All such modifications and variations are intended to be included herein within the scope of this disclosure." Even if Amazon's claims are narrow, the studio set-up it describes is mundane. Will we have patents now on every arrangement of lights and ISO value? Just last year, we puzzled over the fact that the Patent Office gave YogaGlo a patent on, well, a technique for filming a yoga class. How did these patents pass the system's obviousness or novelty standards? Your guess is as good as ours, though in light of the sheer number of low quality patents we've seen asserted these last few years, we're not totally surprised. Best of all, even if your invention never makes a penny, accusing someone of stealing it can. Because in 2011 alone, unused patents alone generated $29 billion in lawsuits, legal fees, and settlements worth tens or hundreds of millions of dollars. So if you have an idea, and you work hard, someday you can get sued by someone who had a similar idea. 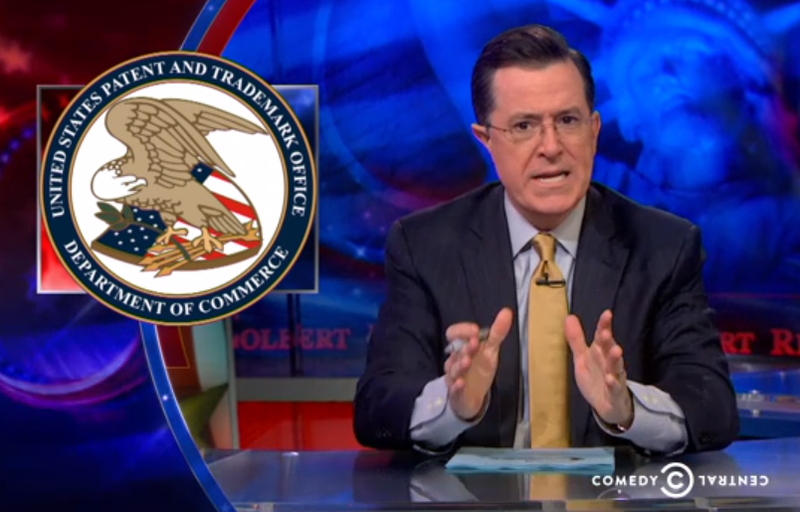 Colbert then brilliantly attempts to file a patent on filing patents. (Remember IBM's and Halliburton's attempts to file a patent on... patent trolling?) While he may run across a few (millions of) pieces of prior art, such a patent might just be the key to tempering the insane number of applications the patent office receives each year.